Fed-up footie fans urged to calm themselves by taking time out to read a poster. Following the London derby between Spurs and Arsenal on Sunday, Grey London produced a tactical press ad to help console the heartbroken losers and prevent disappointment bubbling up into lairy behaviour. The ad continues Grey London's Take:90 campaign for Police Now, a drive launched in August that aims to reduce acts of violence caused by rage. The full-page poster appeared next to the match report in Monday’s Evening Standard and was aimed at football fans looking to vent frustration at a disappointing match result. 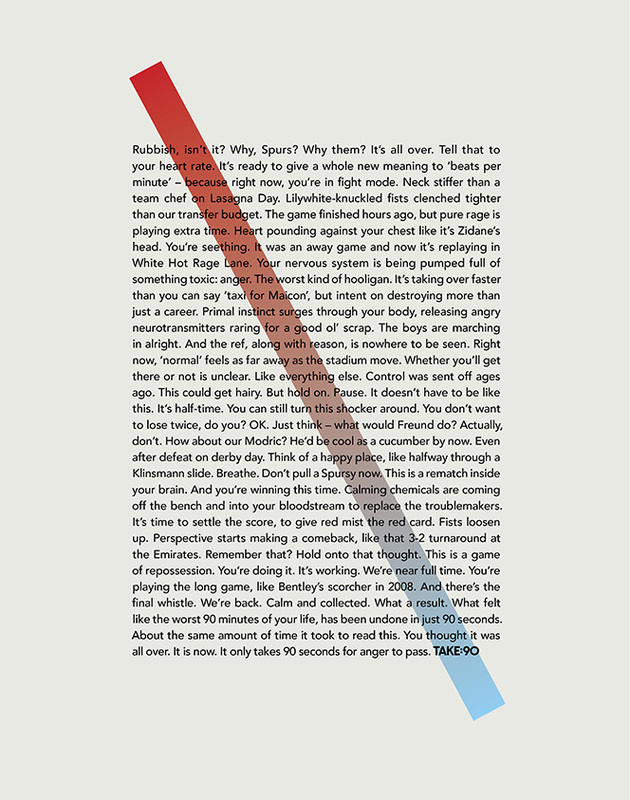 The long copy ad (below) takes 90 seconds to read – the length of time it takes for anger to pass. "Lillywhite-knuckled fists clenched tighter than our transfer budget. The game finished hours ago, but pure rage is playing extra time." It then goes on to urge the reader to pause and avoid venting the rage. "Think of a happy place. Like halfway through a Klinsmann slide. Breathe." The text moves into reinforcing positive feelings of calm, suggesting that composure and common sense are prevailing. "...Give red mist the red card. Fists loosen up. This is a game of repossession. It's working."